When John Fehringer arrived in Alaska in 1980, his plan was to stay only a few short weeks. But as his ferry navigated along the inside passage, John could feel his plans were about to change. The deeper he journeyed into Alaska territory the more he knew that Alaska was about to become his new home. When the ferry docked in Juneau, John cashed in the return portion of his ticket and set out to find a job and a place to live. John soon located a small trailer just outside of town near the Mendenhall Glacier and secured a labor job with one of the local freight companies. This amount of security was just enough to allow John to settle into the Alaska lifestyle and begin to paint. 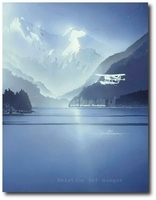 Working with an airbrush and opaque watercolor (gouache), John began developing a technique that would eventually become his signature style and established him as one of Alaska's premiere artists. The success of John's early paintings gave him the confidence to go it on his own and establish a conventional studio in downtown Juneau where he could spend more time making art. In 1984 John published the first in his series of limited edition fine art prints entitled "Inside Waters", a tribute to the passage that had originally brought him to Alaska. There was such an overwhelming response to this first print that the entire edition of 750 prints sold out in less than four months. Since that early release, over 70 editions have been published from Fehringer originals. More than half of these editions are now sold out. Today, John Fehringer's inspiring art continues to generate the enthusiasm of collectors around the US and Canada.